Hi! 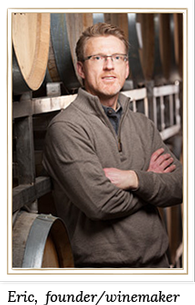 I’m Eric Eide, founder/winemaker at Aberrant Cellars, in Oregon's Willamette Valley, and this is my “Winemaker Journal.” Each month I'll share what’s happening in the vineyards, the winery, and other activities here at Aberrant Cellars. We hope you enjoy hearing about what goes into the passion and inspiration that I have for making great wine! This is one of our most recently released wines. Now that it’s available to our customers, I’d like to share my thoughts about it. Generally speaking, I think the 2015 wines from Oregon will ultimately shine a little more brightly than the 2014 or 2016 vintages, because of the extra time the 2015 wines have taken to develop in the bottle. They’ve been a little slower to develop, but I think they’ll be fantastic wines. The natural structure of the 2015 wines will not be as flashy as those from 2014; or, compared to what 2016 will be. The 2015 vintage should experience a long life in the cellar, almost repaying us for its slow start. This particular wine was very successful in terms of the vintage, because it was one of the later 2015 blocks we harvested. The 2015 harvest was early across the board by Willamette Valley standards, because it was a warmer, drier year for us. These vines were less affected, because of their age. Old vines are resilient to Mother Nature’s extremes, and the heat and dry conditions did not negatively affect the grapes, because the vines have such deep root systems. (The same is true in wetter years.) This vineyard always gives us wines that are more reserved in style; they have a lot to say, with a quieter voice. This is a classic, old-school style Willamette Valley Pinot Noir. I really admire that about the wines from this vineyard. I’m assembling a blend for a new Sidecar wine, which will be a Claret. There are five varieties that are authorized to be blended and bottled as Claret: Cabernet Sauvignon, Cabernet Franc, Petite Verdot, Malbec, and Carménère. In this case, our blend will be 35 percent Carménère, 30 percent Cabernet Sauvignon, 20 percent Cabernet Franc and 15 percent Malbec. And, we will call the wine Off the Wagon. This wine was recently racked and was bottled in late April. The style of wine will be notably different than that of Sidecar, and the winemaking philosophy will also be different than that of Aberrant. The wines will be made from a very small selection of grapes, from specific sections of Southern Oregon vineyards. The wines will have a style of luxurious expression, which will be achieved through more time in barrels and bottles. I plan for the wines to have a richness about them, with more rounded structure, more in-depth character, and more luxurious personalities. At the same time, I aim for them to be more approachable, to a certain degree. All wines will be single-vineyard, from a specific pocket of the vineyard, and will also be single variety.